You join Windows Insider program in order to have fastest access to latest builds of Windows 10 Technical Preview or Insider Preview builds, at the same time helping Microsoft to beta test and report bugs on the new operating system. However, as with all beta software, preview builds of Windows are often unstable, and not suitable for production use. With the arrival of final RTM build of Windows 10, and may be it’s time to call it quit. During the preview builds of Windows 10, Microsoft provided only one messy way for Windows Insiders who want to quit and leave the Windows Insider program, that’s by reinstalling and rolling back to the original or previous OS version that came with or installed on the device, such as Windows 7, Windows 8, Windows 8.1 and so on. The process will wipe off Windows 10 from the PC, and you will not be able to stay in Windows 10. In Windows 10 RTM Build 10240, the process to stop Insider builds (effectively leaving the Windows Insider program) is made much simpler. And best of all, you’ll stay activated with Windows 10 installed after leaving the Windows Insider program. Here’s how you can quit and unlink your Windows 10 RTM from Windows Insider program. Go to Windows Update via Update & security. In “Windows Update”, click or tap on Advanced options link. Under “Get Insider builds” heading, click or tap on Stop Insider Preview builds (previous name: Stop Insider builds) button. 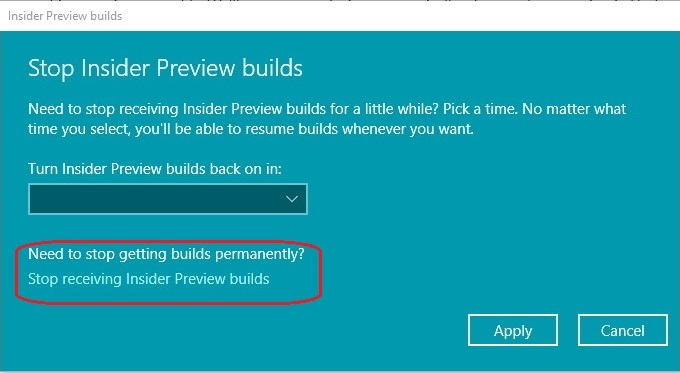 Updated: Microsoft now allows you to choose to pause or stop receiving Insider Preview builds, where you can select to turn Insider Preview builds back on in 1, 3, or 5 days. To quit, hit Stop Insider Preview builds. Confirm your intention to leave the Windows Insider program by hitting the Confirm button. Restart your computer by selecting Restart now, or Restart later if you plan to manually reboot the device later on. That’s it. After reboot, your computer device is still running Windows 10, but no longer part of Windows Insider program. Hence it won’t receive any new preview builds. Most of the case, the Windows 10 stays activated, regardless of which previous operating system you’re coming from. You can even remove the Microsoft account (MSA) and switch to use Windows local account.